Discussion in 'Hommes' started by CharlottefromCA, Aug 26, 2009. His face looks like a painting, beautiful beyond words, thanks flashbang. 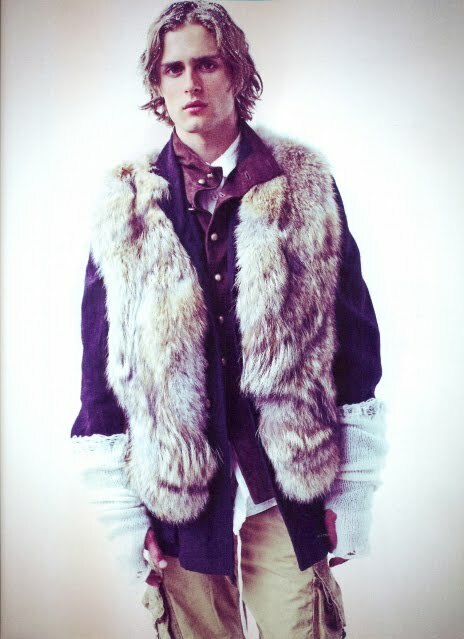 As models, Boyd Holbrook, Vincent Lacrocq, Jacques Naude, and Jamie Strachan are used to being looked at. But now, if you please, they’d like you to take a look at something else. Next month, Strachan et al. are opening BAG, a gallery carved out of the Bushwick studio space they all share. BAG—short for Be a Giant—will launch with an exhibition of Holbrook’s sculpture and photography, and shows of work by Lacrocq, Naude, and Strachan are in the works. But the proprietors’ intent is to open the space to artists who live and work nearby, and they’re treating BAG less as a gallery, per se, than as a workshop for their own varied endeavors. A visit earlier this week, for instance, found Strachan making notes on a screenplay he’s been working on, and Lacrocq tightening up a video edit. (Holbrook and Naude were off-site, but evidenced by their creative detritus.) “I see it being kind of like a blog,” Strachan explains. “It’s a platform for whatever interests us, and sometimes we’ll use it in a fully thought-out way, and sometimes it will be more spontaneous.” They took a break for a chat with Style.com. What inspired you to launch BAG? Jamie Strachan: It was pretty organic. We’ve all been friends for a while, but I guess you could say it started with the fact that Boyd and I decided to get a place together, somewhere we could work out of. But we needed a roommate, and after a few false starts, we wound up with Vincent. Then, after a while, we all got bored of living in the dust and squalor from Boyd’s studio—it’s messy, sculpting—and it just so happened that this development was coming together, so Boyd approached the landlord about setting up a proper studio. Which is where we are now. Vincent Lacrocq: And then we all just moved our desks in here. Obviously, you like working in close proximity to each other, but are you all working together? VL: Sometimes yes, sometimes no. Sometimes we participate in each other’s work, but also, you know, part of the reason I wanted to live with Boyd and Jamie in the first place was that I liked the idea of being around people who were undertaking projects. It’s inspiring. JS: Yeah, totally. Boyd in particular is quite shameless about his goals, which I admire. I think the key thing is, we can all crowd around because we’ve got a good overlap of interests. Like, I got into modeling in the first place because I wanted to pay for art school, and then modeling kind of took over for a while, but I’ve never stopped sketching, and I paint and I take photographs, too. So there are ways I can be helpful. And Jacques has experience with graphics and video, and so on. VL: We all share some of kind of underlying aesthetic, which is hard to describe, but which makes it pretty easy for us to tap into each other’s work. What do you have envisioned for the space? VL: We’re keeping it pretty open. We’d really like to be a resource for the neighborhood. We already have a lot of artists who work nearby coming in, asking us what we’re up to. JS: A woman wandered in the other day; she has work in places like the Museum of Contemporary Art in Washington, D.C., and after we got to talking, she was like, I’d really like to do a show here. I love that. I think we’ll have more of that, once we’re actually open and operational. VL: And once we clean the windows. JS: Ideally, if we just keep the door open to artists, we’ll get a pretty good read on the interesting work going on around here. I mean, Bushwick is covered in artists. That all sounds pretty philanthropic. JS: Well, look. We all acknowledge that we’re lucky to have been successful in our modeling careers, and for the moment, this doesn’t have to be profit-making. We can loan our luck to other people, like, have artists-in-residence who work out of the space. And perhaps we collaborate on T-shirts, limited-edition skate decks, things of that nature. I mean, on principle I’d like to have there always be stuff here that’s accessible, not just art with a capital A, if you know what I mean. And down the line, I can see BAG turning into a kind of creative services cooperative—campaigns, music videos, whatever. One-stop shopping. If we invest in our community, I think we’ll get our own back, eventually. Speaking of modeling, has your experience in the industry affected you creatively? VL: Of course. I mean, as a model, you get to work with people who are incredibly talented. It gives you a sense of what’s possible. You can learn a lot, just paying attention to what’s going on behind the scenes on a shoot, and beyond that, it’s like, you understand what it means to push. To take risks. JS: It sort of demystifies the process of making things. VL: Yeah—you realize, OK, I can make things, too. What do you have planned for the launch? JS: We’re opening with a show of Boyd’s work. His sculpture, and his photographs of the coal mine where his father works. And yes, he’s aware of the Zoolander reference. Thank you for sparing me the need to point that out. JS: We’re all in on the joke. I know it’s easy for people to write this off as some kind of narcissistic thing, but honestly, the only reason we’re even starting with a show of Boyd’s stuff is because we’re still figuring out how to do this. If we **** up his exhibition, that’s OK. I wouldn’t want to **** up someone else’s. Where are Jacques and Boyd, by the way? VL: Boyd had a meeting in the city, and Jacques is on a shoot. JS: Nobody’s quitting any day jobs just yet.